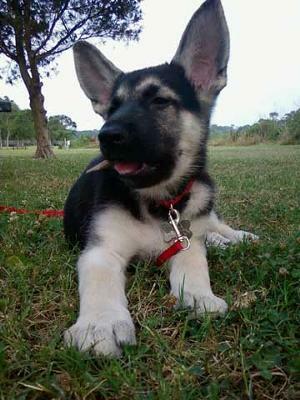 This are our GSD Sakema ( native american for king ) we adopted him at the age of five weeks. He has been a wonderful companion and friend to my wife and I. He has become a very important part of our family. His love and loyalty is growing more and more each day. He has just started school and doing great. We have been so lucky to watch him grow into a beautiful guardian angel. Join in and write your own page! It's easy to do. How? Simply click here to return to GSD pup story.